If your child client becomes anxious and suffers tummy-aches and pains before tests, new activities and other situations they could be suffering from a nervous stomach. 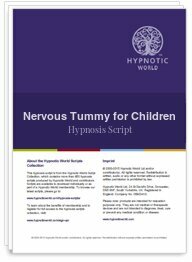 This Nervous Tummy for Children hypnosis script is suitable for younger children and those up to the age of 11 or 12 or anyone who loves stories. It uses a metaphor of a circus performer to enable the child to anticipate events with a calmer, more settled frame of mind. Help your younger clients to approach new ventures with confidence with this hypnosis session from Hypnotic World.